wondering, "how could I possibly spend that much on a pillow and not have to force myself to eat ramen for a month straight as a result?". Not that I don't believe in independent artists or handcrafted items (in fact I largely support these artisans and I understand the quality that goes into their work), but I simply cannot justify spending $70-$150 on a single pillow at this point in my existence. So I decided to make a few of the pillows I used to style the couch, loosely inspired by some great trends I'm seeing out there nowadays. The first is a great classic square plaid pillow. These pillows can be made with materials that are of relatively low cost, and could be fit for a fun afternoon of crafting or a sewing/ Netflix night. This plaid pillow cost me roughly $10 to make. 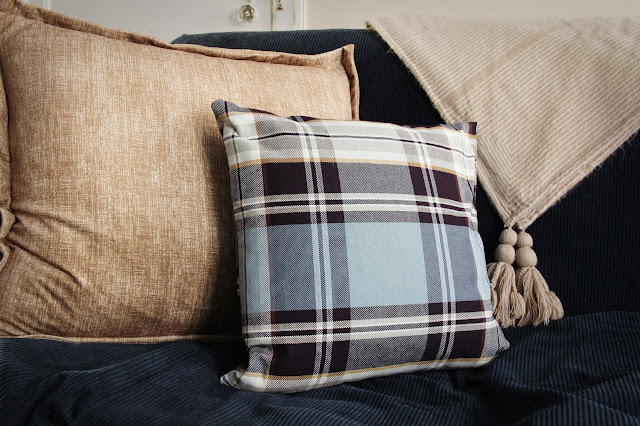 For the classic simple pillow, whether it be plaid, plain or you choose to add your own spin, you'll need to pick your fabric from a fabric store. I got this great plaid at Jo-Ann's, and for the size pillow I made, I only needed half a yard. There are a couple different options for pillow filler — batting or a pillow insert filled with down. I knew from previous projects that these options are great and not too expensive, but I was really feeling like saving as much as possible on this project so I actually opted to find a great shape pillow that I liked at Goodwill and replace the outer cover. This is totally up to the discretion of the buyer. I could see where people would opt to spend a few extra bucks not to use a pillow that someone else previously owned, but I decided to pick out my pillows carefully, and if I opened them up and they looked gross I was going right back to Jo-Ann's for a pillow insert. Luckily, the insides of the pillow looked fine and I had gotten myself a great pillow insert for $4! You will also need scissors, a seam ripper (or you can just use scissors), and a sewing machine (unless you're really patient and want to hand stitch the whole thing). The first thing you need to do is take the old covering off your pillow if you're going with the Goodwill pillow route. I was lucky and the covering on my pillow was a button closure, so I didn't need to cut the seams out, but you may need to if yours is all sealed up. Once the old covering is off, use it as a stencil to cut your fabric to size. You will need to pieces of your fabric cut to size for your pillow. Take your fabric and place it back to back (pattern sides facing each other) and line them up flush. Next, sew with a clearance of about a 1/4 - 1/2 inch along the outside edge of your pillow pieces, but not completely all around. For a smaller pillow, I would only sew three sides of your pillow up, you want to be able to get your filler inside! Once you've sewed along the edge, inside out your pillow pieces so that the seams are hidden. You may need to use your fingers to poke out the corners to make sure they look nice and crisp. Then you can put the pillow insert into your pillowcase. Now all you need to do is finish up the last side of your pillow. Using a needle and thread, tuck the tied end of the thread into your pillow seam, and begin a whip-stitch along the last side of your pillow. You'll need to fold the edges inward and stitch up the opening. When you finish, tie a knot at the end of the thread and feed it back through what you've already stitched with your needle. This hides your knot inside the seam. Then you can snip the end of the thread and it should stay hidden in the pillow. And there you have it, a simple home-made pillow!